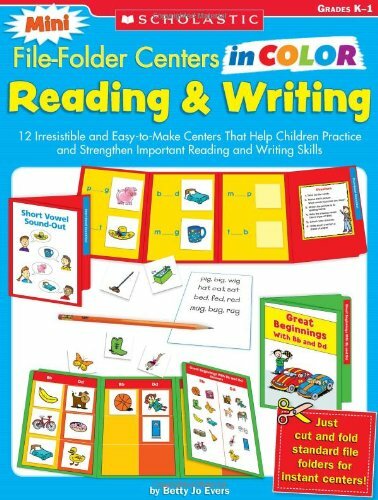 [PDF] Mini File-Folder Centers in Color: Reading and Writing (K-1): 12 Irresistible and Easy-to-Make Centers That Help Children Practice and Strengthen Important Reading and Writing Skills | Free eBooks Download - EBOOKEE! Description: These unique, easy-to-assemble mini centers will be a big hit with kids! Simply cut file folders in half and fold into quarters. Then glue the colorful templates to the mini folders and the centers are ready to go! Designed to reinforce important reading and writing skills, the activities are great for students to use independently or in learning centers. And the small size makes them easy to store as well as to send home with kids for extra practice. Topics include matching letters, letter-sound relationships, segmentation, vowels, rhyming, sight words, listing, and more! For use with Grades Kâ€“1. No comments for "[PDF] Mini File-Folder Centers in Color: Reading and Writing (K-1): 12 Irresistible and Easy-to-Make Centers That Help Children Practice and Strengthen Important Reading and Writing Skills".